Last night I attended another book launch, this time in the City of London. 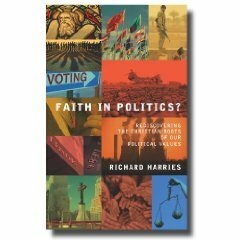 The book was Faith in Politics? by (Lord) Richard Harries and the event took the format of a conversation between Lord Harries and Christopher Landau from the BBC World Service. The question of the equalities bill was, inevitably, raised, and Lord Harries framed it (as many others have) as a balance between liberty and justice. The church, he felt, on this occasion, had sought too much liberty at the expense of fairness. It strikes me that this is part of the song our culture is singing. They want freedom. They want justice. But they can’t see how the two fit together. They are being fed the line that the concepts are mutually exclusive. If we’re going to be fair, that means someone’s freedom will have to be restricted. If you want total freedom, that means life is going to be unfair for a lot of people. But there is another song to be sung. Liberty and justice are not mutually exclusive, they’re utterly compatible, when grounded in love and, more specifically, trust. The reason Group A wants to stop Group B from deciding the criteria by which it will select is staff is because it doesn’t trust Group B to act lovingly and select based on the best fit and the best interets of both the organisation and the wider society. In a (model) family mum and dad teach their children to act lovingly, fairly and justly towards each other. Child A learns that if he chooses to give his sister the smaller piece of cake this time round, mum is going to let said sister cut and choose the pieces of cake next time round. Thus he learns it is in his best interests to be fair. But the next time he comes to cut the cake, and one piece turns out bigger than the other, he has to trust both his mother and his sister to deal fairly with him before he will be willing and able to sacrifice that big slice. Only when he has learned to trust and to love will he be able to truly live in freedom – his mum will know she can trust him to act fairly towards his sister without her having to watch over him and impose sanctions if he errs. In the Kingdom of God we live in both liberty and justice, because we love and trust one another and the God whom we serve. Let us model this to our friends, our workplaces and our communities, and watch the transformational work God will do.